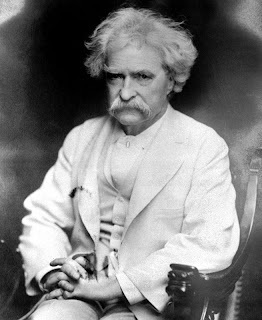 In his will Mark Twain made one of his final requests to have his 400 page autobiography be published 100 years after his death. And yesterday it was 100 years, and as it was written the book shall be published. Twain led a controversial lifestyle, and perhaps slightly deviant. The reasons for the delay of publishing is probably due to the content, and what he thought of the world from politics, to religion, though I guess we won't know for sure until the University of California opens it vault and lets us see what is inside. I am certainly excited to see what the book will be like, this has made me wonder about the impact of making such a decision. First, instead of an autobiography I wish it was another work of fictional prose. Although I realize that makes little sense, as the only reason he would hold off publishing such a work would be because he didn't want to embarrass friends or family at the time. But it would be great for an author to have the foresight to say, "I just wrote a magnificent piece of fiction, but I want people from another time to enjoy it with fresh eyes." This autobiography will be studied extensively I have no doubt, and will be heavily scrutinized and criticized and will quickly make its way into college required reading lists. Imagine, however, if it was instead another chapter in the Huck Finn saga. Wouldn't it be amazing to get a sequel to a book that people who lived and died in the time of the original never got to experience? Not fan fiction, but a real genuine sequel. Imagine other authors doing this, like say, Lewis Carroll. What if he wrote a third Alice and Wonderland story and it was published for the first time today. After all the adaptations of Alice that have come out since the original. The horrible Disney film that came out this year that acts as a sequel to the original books, or that video game American McGee's Alice. You could compare directly what Carroll's vision of his story, with contemporary versions. I'm guessing the modern versions would be blown out of the water. I think modern authors should start doing this. Despite what you think about Harry Potter and J.K. Rowling it will be the Adventures of Huckleberry Finn of our generation. Imagine if Rowling came out tomorrow and said she wrote a new Harry Potter book, but it wouldn't be published until 100 years after her death. There would be riots in the streets. But imagine being the people 100 years in the future getting a fresh new chapter in the story from the original author that has never been read before. That would be amazing. The point in all this, is that books are timeless. And when the author dies, so do their works. There is a painful realization that you will never get to further adventure in their imaginations. Douglass Adams fans experienced this when he died young, without giving a proper conclusion to the Hitchhikers Guide series. So taking Twain as an pioneer, I think authors should write at least one novel, any kind of novel, not necessarily a sequel like I mentioned, or an autobiography, but just one book, and lock it away and have it be published years after their death, just so other generations can experience the newness of what might be the best novel ever written.